Silver wedding bands represent pure love, which is precisely the premise that you and your companion fall in love with each other. 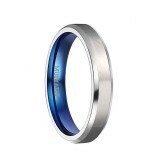 So choosing a silver wedding ring is the right decision for your wedding. Every pair of blessed lovers is worthy of a unique wedding ring, and our designers have crafted a variety of styles. No matter which type you like, you can find it here. For example, both ring with ingenious combination of various colors and silver, and pattern grooved style ring is available here. We are so excited to serve you. If you have any questions, you can always contact us. Thank you for your trust.